This height-adjusting coffee table, Genie, is the ultimate in stow-away furniture. 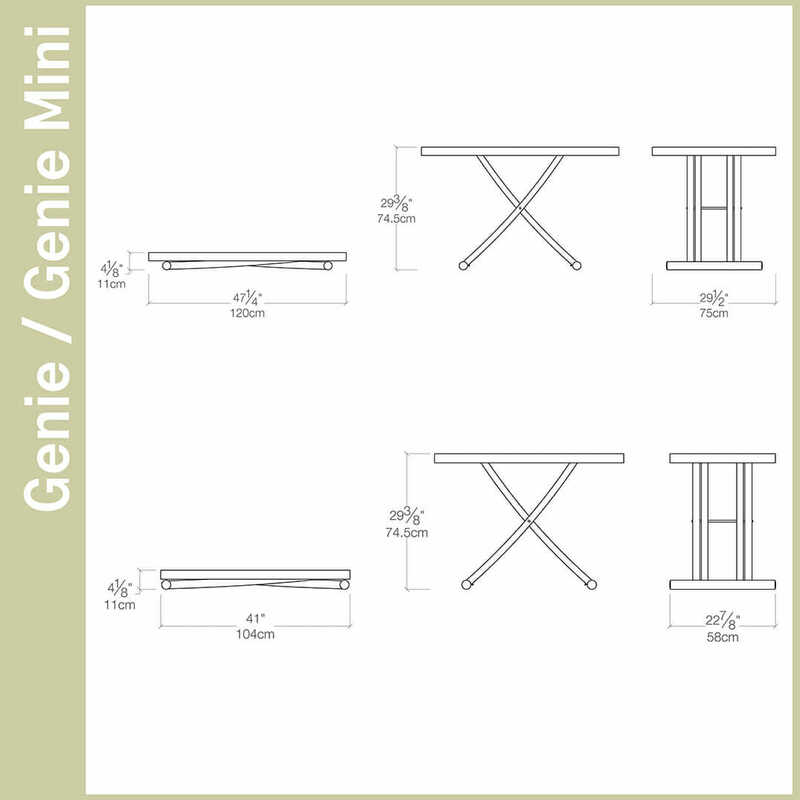 With a minimum height of four inches, the Genie will slide right beneath our sofa wall beds, like the Nuovoliola 10, or Penelope 2 Sofa. The coffee table lifts with just a switch of the lever, and it rises with ease to dining table height—and everything in between.AL16 Available in two sizes: Genie and Genie Mini. To see the Genie or the Genie Mini in action, Make an Appointment at your nearest showroom. Some configurations available for Quick Ship, see what's in stock. Transforming Tables from Resource Furniture offer multifunctional living solutions to maximize every square foot in any space. We offer attractive, modern pieces that can be raised and lowered from coffee table height to dining table height, like the Passo, or folded up/expanded as required, such as the Plurimo—allowing you to look beyond typical choices and layouts for an unconstrained approach to flexible living. All of our Transforming Tables can be customized in a wide range of lacquers and finishes to suit your aesthetic. We also offer a selection of our best-selling transforming tables in our Quick Ship program for delivery throughout the U.S. For more information about our tables, contact us to schedule an appointment or stop by one of our showrooms to speak with one of our design experts.